"HostPapa" Reviews (Apr 2019) - Why 4.7 Stars? Hyper-focused on its customers, HostPapa wants to help small businesses move through the ranks of shared and VPS hosting. 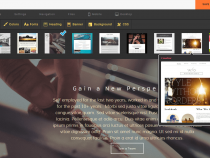 Users can get started with an intuitive website builder and grow to premium, low-density servers. With the help of around-the-clock support and a focus on your future, HostPapa makes an excellent choice for your first host. “One of the earliest hosting companies to power its datacenters with renewable energy, HostPapa is an established provider that furnishes customers with plans backed by award-winning customer service and covered with a bevy of features. Currently hosting more than 500,000 websites, HostPapa is the epitome of a high-value, low-cost provider. We went straight to the source to find out what sets HostPapa apart from other hosting companies and sat down with CEO Jamie Opalchuck, who said HostPapa is "a little bit different than the average beast" in the hosting industry. The privately-owned company considers itself less of a straight-up hosting provider and more of a one-stop shop for small businesses looking to grow their brand and online presence. Whether through CRM tools, automatic backups, or unlimited storage, we found that HostPapa excels at giving its customers a seamless, easy experience. Each user gets a dedicated account manager and a single bill, no matter how many services are added. That account manager will recommend products, such as email platforms, based on your needs — even if it means suggesting Google Apps or Microsoft Office 365 instead of HostPapa's proprietary platform. "We want to act as consultants and help our customers reach new heights," Jamie said. "It's a different take on the hosting industry." Get started on HostPapa now. “Where HostPapa shines is with its shared hosting, which offers affordable and feature-rich plans geared toward helping both website and small business owners grow their online presence. HostPapa wants to be more than just a web host, according to CEO Jamie Opalchuck, who told us that the company aims to be a 1-stop shop for small businesses looking for a seamless and simple experience to help them grow. "We're looking for a person that we can bring in for $4 a month and help him become more and more successful," he said. "Our goal is to find that person that just doesn't have the IT support they need. They can call us, and we'll actually answer the phone." Once we signed up and got our hands dirty with HostPapa's services, we found they are poised to achieve that and more. A ton of features make marketing, eCommerce, and email a breeze. Beyond Google Apps or Microsoft Office 365, HostPapa also offers two in-house email plans with a user-friendly interface and modest functionality. HostPapa's email storage limits pale in comparison to the Gmail or Outlook offerings, but the price — less than half of Google and Microsoft — makes HostPapa a great alternative. "Our plan might be more economical, but it's not necessarily for everyone," Jamie said of HostPapa's email packages. "We want to act as consultants and help our customers reach new heights." In addition to unlimited bandwidth and CloudFlare's content delivery network, Business Pro plan customers can also boost speed and performance with Rocket Fast Premium Servers — double the RAM, double the hard drives, and up to three times faster. HostPapa's 99.9% uptime guarantee isn't spectacular but should be plenty sufficient for most users. Laura Bernheim (HostingAdvice.com): This rating is not available yet. We haven't evaluated HostPapa for the "Dedicated" option yet as they do not currently offer this type of hosting service. We're always working to keep our reviews up-to-date so check back later! Does HostPapa already offer the "Dedicated" option? Let us know. “If you've outgrown shared hosting and are ready to take on new challenges and customers, consider expanding with HostPapa's high-performance VPS hosting. The company's Linux plans simultaneously give users high levels of both control and flexibility. The affordable, fully managed solution is easy to scale as your site or application grows. We found HostPapa's 1.5GB RAM and 50GB of SSD storage to be a touch shy of competitors, but users can quickly scale resources to upward of 24GB RAM and 1TB of storage. HostPapa makes up for the slightly limited specifications with fully managed services, however. "Managed" can mean anything to hosts, but HostPapa definitely puts its technicians to work for you. Included in those services are automation, performance and firewall troubleshooting, email and backup configuration, software upgrades and migration, and security audits. "We're doubling down on support," CEO Jamie Opalchuk said. "We're doubling down on a lot of things that make the client experience better." “Nearly all hosts these days include easy installations and support for WordPress, the world's leading content management system. While HostPapa is no different, we discovered the company's ultra-attentive support team can help new users navigate the sometimes challenging platform. Available through Softaculous, we found the WordPress installation to be incredibly simple — find the WordPress logo in your control panel and follow the prompts to set up your site with the appropriate title and tagline. Paired with all the apps and features HostPapa offers for marketing, ecommerce, and email, WordPress hosting opens the door to millions of plugins that should take care of all your needs. Also, you can give WordPress an extra boost by taking advantage of HostPapa's partnerships: CloudFlare's content delivery network for speed, SiteLock protection for security, and Let's Encrypt SSL certificates for additional safety and ecommerce capabilities. "Our play is what we can supply a small business owner to help in any kind of way with their web properties," CEO Jamie Opalchuk said when we sat down with him. "Keep it simple; that's our place." If you run into trouble, PapaSquad support is only a phone call, email, or chat message away. Technicians are available 24/7/365 to help, as are HostPapa's video tutorials, downloadable manuals, and knowledgebase. "We're doubling down on support," Jamie said. "We're doubling down on a lot of things that make the client experience better." “Despite a few limitations that might not matter to rookie site owners, HostPapa offers an easy-to-use web builder with a surprising number of features. Coding experience or not, designing a website can be a long, confusing process. Hiring someone to do it for you can be expensive, stressful, and still doesn't guarantee you'll end up with something you like. CEO Jamie Opalchuk told us how HostPapa's site builder lets you avoid all the hassle and get a beautiful, professional website by yourself in a matter of minutes. Build and manage your site on your own, whether you're starting from scratch, getting a fresh look, or looking for a better tool. We dug into the drag-and-drop editor, which is intuitive for the earliest of beginners — just click on the text you want to edit or area where you'd like to upload an image. For the more advanced users, you can customize your site even more by taking a swing at the HTML or CSS code. When we started our site, HostPapa showcased more than a dozen responsive template options. Once we made our selection, we could see more than 100 other choices. Not many site builders allow you to change templates once you've started adding content, so we appreciate the flexibility that HostPapa allows. HostPapa's builder really shines, however, in the number of widgets you can add to your site. Easily add text, images, maps, videos, and social media widgets right from the start, or upgrade to include one-click publishing to Facebook or an ecommerce store. You can build forms with HostPapa's own tool or through Wufoo, just like you can add email marketing features through a Constant Contact integration. "Our play is what we can supply a small business owner to help in any kind of way with their web properties," Jamie said. "We want to provide a seamless, easy experience." Once your site is set up, you can preview how it will look on both desktops and mobile devices. You can always update on the go, from any web browser. The site builder is included for free with HostPapa's shared hosting plans, or you can buy builder-specific plans to add even more features. Need help getting started? HostPapa's Business and Business Pro shared hosting plans include a 30-minute phone call or video session with one of the company's support agents. Customer support is available around the clock by email, phone, or live chat. Users can access more resources through an extensive knowledgebase, video tutorials, weekly webinars, and downloadable manuals. 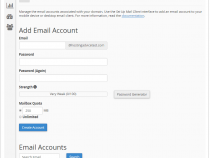 For $1 per month per user, HostPapa's basic email package offers unlimited inboxes, IMAP connections, POP3, and SMTP. HostPapa's advanced email plan boosts storage capacity, archives, and file sharing for $2 per month per user. Google Apps and Microsoft Office 365 are available for customers and businesses that need extra emailing power. Have as many websites, domains, databases, and email accounts, and as much disk space and bandwidth as you want when signed up for Business and Business Pro plans. 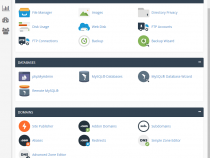 Manage VPS servers with cPanel, SolusVM, and root access. You can also have an unlimited number of MySQL databases. Add CloudFlare content delivery network, SiteLock security, SSL certificates, or automated backups if you wish. Easily add text, images, maps, videos, and widgets. More tech-savvy site owners can take control by editing HTML and CSS. Responsive themes are the norm at HostPapa, and you can preview how your site will look on both mobile and desktop before publishing. Set up an online store with the Enterprise plan. You can track inventory, give real-time shipping quotes, and integrate with services such as PayPal and Stripe. All of HostPapa's services are built with the users' experience in mind. After testing out HostPapa's various features, we found the account management, cPanel, site builder, and email interfaces incredibly clean and easy to use. HostPapa is a great deal for the number of features and level of service you get — particularly on the shared hosting plans. The company's VPS plans, however, are a bit high-priced when comparing what you get from competing companies. For a hosting company that prides itself on helping small businesses grow, however, HostPapa's competitive pricing means new customers don't have to make a big investment to increase their online presence. "We're looking for a person whom we can bring in for $4 a month and help him become more and more successful," CEO Jamie Opalchuk said. "Our goal is to find that person who just doesn't have the IT support they need. They can call us, and we'll actually answer the phone." HostPapa's 99.9% uptime guarantee isn't terribly exciting but should be plenty sufficient for most users. Otherwise, the company seems truly dedicated to making its support technicians readily available to customers whenever they need help. In addition to the seemingly standard 24/7 availability through phone, email, and chat, HostPapa sets itself apart from the rest with weekly webinars and one-on-one consultations. "We're doubling down on support," CEO Jamie Opalchuk told us. "We're doubling down on a lot of things that make the customer experience better and as simple as possible." Wondering how HostPapa stacks up againt other web hosting services? See our host-vs-host reviews below and compare them side by side. 1 out of 3 times. HostPapa aims to give you all the tools you need to grow your business or online presence. "Our play is what we can supply a small business owner to help in any kind of way with their web properties," CEO Jamie Opalchuk said. "We want to provide a seamless, easy experience." From the drag-and-drop website builder to around-the-clock PapaSquad support, HostPapa is there for you every step of the way. Whether you're looking for shared, VPS, or site builder hosting plans, HostPapa supplies a variety of add-on tools that handle email, performance, and security to customize your experience.